Don’t be afraid to ask the cleaning representative questions regarding their company’s operations, what a cleaning scope entails, and any important information you may need. Find out how long they have been in business for, what other facilities they clean, floor care services they offer, cleaning assessment tools and inspections they practice, and more. Make sure you are asking the right questions to find out if the company is capable of taking care of your work facility’s needs. Compile a list of questions ready to go upon your initial meeting with the cleaning rep. The more answers you receive, the more confident you will feel in knowing that they are reliable, trustworthy, knowledgeable, and have extensive cleaning experience. In addition, this will help you decide which cleaning company is the right fit for your office. Signing a contract with lots of fine print can potentially lead to confusion and issues. Talk with the company to see what kind of service agreement they uphold. Feeling pressured to be locked into a long term contract can be unnerving and irritating. Try to find a service with a straight forward commitment. Also, make sure the cleaning company is bonded, licensed, and insured. Lastly, discuss pricing with the office cleaning company. Pricing is competitive within the industry so talking to the cleaning representative about the quote received is understandably okay to do. 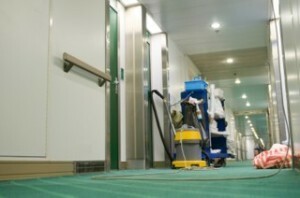 Cleaning companies care for many types of facilities throughout Massachusetts: Office buildings, schools, medical facilities, health clubs, gymnasiums, banks, car dealerships, industrial facilities, construction job sites, and much more. Requesting a few references can reassure you that the cleaning company is professional, reliable, and good at what they do. For bonus points; See what other similar-type buildings they perform nightly cleaning in. Doing this will restore certainty in the janitorial service you are hiring. Apple Corps provides exceptional office cleaning services to facilities in Massachusetts. With 36 years in the janitorial industry, we clean over 2 million of square feet every single night. We are licensed, insured, and bonded as well as offer competitive pricing for our cleaning services. Another benefit to choosing Apple Corps cleaners is there are no long term contracts. Call today to learn more about our janitorial company and how we can provide cleaning care to your office or work facility.